The attitude of humans especially American citizens towards marijuana (also known as weed or pot) have significantly varied from the time its use was illegalized in the 1930s to the present day. In 1970, the US Congress considered marijuana has "no accepted medical use" and placed it in Schedule I of the Controlled Substances Act. However, public opinion demand for legalization of marijuana has been rising steadily since early 90’s. So far, 25 out of 50 states in the US and DC have legalized the medical use of marijuana. One of the most egregious outcomes of weed prohibition is that many sick people cannot legally access the medicine that would work best for them. Numerous forces including the Drug Policy Alliance (PDA) are dedicated to legalizing weed at both the state and federal levels. They are also committed to improving medical marijuana programs to protect the rights of patients and access to medicine better. In the contemporary world, whether or not to legalize marijuana for medicinal use is still debatable even among scientists, pharmacists, and doctors. All in all, I fully support medical marijuana having come across pieces of evidence that revealed its medicinal effect on loss of appetite, vomiting/nausea, chronic pain control and kids with grand mal seizures among other cases (Porche). This paper will focus on proponents of medical marijuana and their ideologies on how marijuana can transform the health care system and change millions of lives. First, there is a myriad of research done in the 21st century that supports the use of marijuana as treatment. A 2001 study showed that several analogs and pure tetrahydrocannabinol showed significant therapeutic benefits in the relief of vomiting and nausea as well as stimulation of appetite in patients with wasting syndrome. There are also pieces of evidence that clearly illustrate antispasticity and analgesic effects that prove to be clinically useful. Although some may argue that bronchodilation in asthma and intraocular pressure in glaucoma are not reliable, sufficiently strong or long lasting to provide a valid basis for therapeutic use, the anticonvulsant effect of marijuana’s cannabidiol is promising to warrant further well-designed clinical trials. Pure cannabinoids administered parenterally, orally or rectally have proved to be effective and are free of the risks of chronic inflammatory disease or upper respiratory cancer related to smoking crude cannabis (Kalant). Furthermore, the American pharmacopeia in the 19th century listed marijuana as useful in treating; tetanus, rabies, neuralgia, dysentery, hemorrhage, anthrax, typhus, cholera, opiate addiction, gout, incontinence, insanity, convulsive disorders, tonsillitis, and excessive menstrual bleeding. · Post-traumatic stress disorder (PTSD). This is a clear indication why states like Massachusetts, California and New Jersey have legalized the medical use of cannabis. The relationship between American state laws permitting medical marijuana and adolescent marijuana abuse is controversial. There’s a growing concern that marijuana acceptability would increase its use after passage that could lead to adverse effects (Hasin et al.). This assertion is entirely misguided since as I stated above, the law allows only “primary caregivers” or people using it to combat illnesses marijuana can cure. Otherwise, it would be illegal possession. Legalization of medical marijuana is justified because indeed some studies reveal that it can cure a myriad of illnesses. 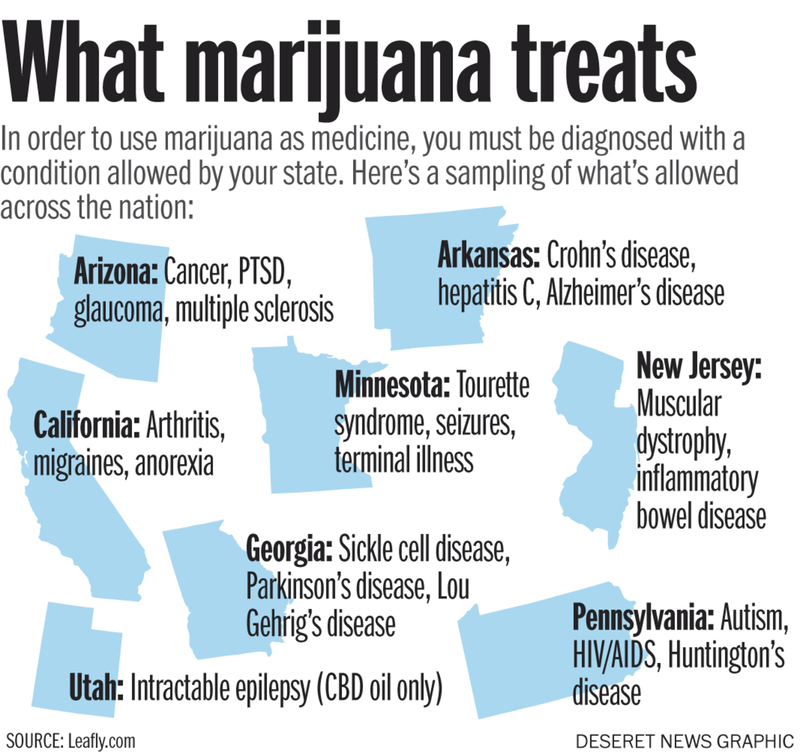 We can even project that in the future, all states will legalize medical marijuana. A. Ballot initiatives in states like California have made it possible for its residents to use pot for medical purposes. B. The passed Proposition 215 permits possession and cultivation of weed by “primary caregivers” or individuals using marijuana to combat “any…..illness for which it (pot) provides a relief”. A. There’s a growing concern that marijuana acceptability would increase its use after passage that could lead to adverse effects. A. Legalization of medical marijuana is justified because studies reveal that it can cure a myriad of illnesses. B. Implementation: In the future, all states will legalize medical marijuana.